"Commerce Street Works Messrs. H. Aynsley & Co. (the manufacturing partner being Oswald Deakin) manufactured all the usual varieties of lustre, Egyptian black, drab, turquoise and painted ware, as well as stoneware mortars. The works were originally carried on by Wooley, and afterwards by Chetham & Robinson during the 1822-37 period. After remaining for half a century in the family of Chetham, they passed into the hands of H. Aynsley & Co. in 1873. Messrs. H. Aynsley & Co. Ltd. continue at the Commerce Works today." 1796 1810 Chetham & Woolley Chetham died and Richard Woolley continued at Turner's Pottery. (1810-1814). 1810 1834 Chetham (& Son) The Chetham was the widow Ann Chetham. 1873 ?? Herbert James Aynsley Eldest son of John Aynsley. Herbert James Aynsley: the eldest son of John Aynsley, went into business on his own account at the age of 22 in 1873 as a manufacturer of earthenware. The factory (previously belonging to the Chetham family) was located in Commerce Street, Longton. The works is shown on the 1877 map on the left hand side of the street, below the Zion Chapel. Herbert became a partner in his father's firm c.1880. 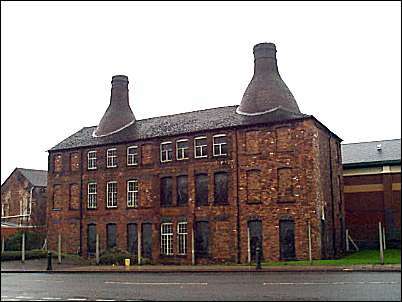 After he retired from the firm in 1900 he went into partnership with Hugh Irving and formed the Star China Company which manufactured fine bone porcelain in the Paragon Works in Sutherland Road, Longton.